I was asked about the sectoral balances in Canada, and the chart above shows the data. This article comments on some of the trends in the chart above. The top panel shows the net lending of domestic private sector, divided into households (including non-profits) and corporations. Unfortunately, the data set I am using starts in 1990, and so I cannot show the longer term trends. However, we see an important shift in the household sector saving behaviour -- they switched from being a net lender to a borrower. This is related to the loosening of lending standards for residential mortgages. I am not showing the debt-to-income ratio for households, but as is well known, it has exploded over the past 15 years or so. This change in household behaviour is similar to what happened in the United States (and other "Anglo" countries). Corporations have moved to being a persistent net lender. (Historically, the corporate sector was a net borrower, but it shifted towards balance at the beginning of the data set shown above.) That is, corporations generate more cash flow than is needed for investment. This has perhaps help stabilise the business cycle, as there is less need to retrench when a recession hits. However, the household sector is the likely source of instability going forward. 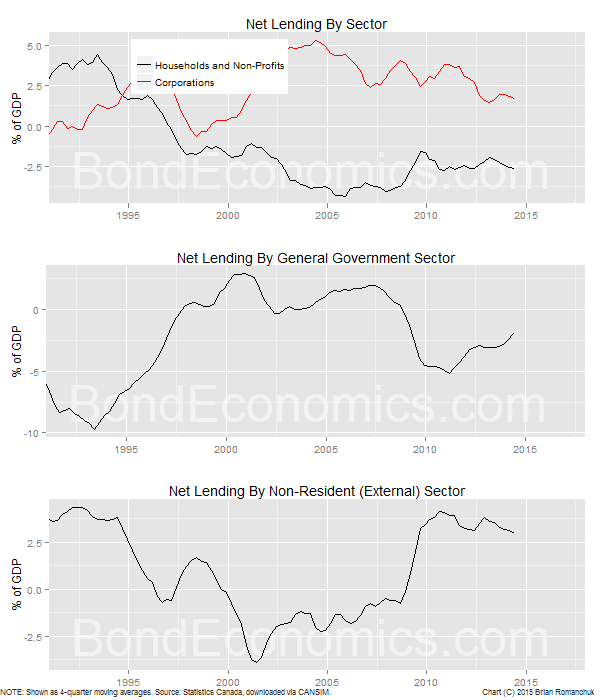 The sum of net lending across all sectors of the economy has to equal zero (within statistical measurement errors). The flip side of the domestic private sector balance are the balances for the government and external ("non-resident") sector. The bottom panel shows the balance for the external sector, It follows the trends in trade; if Canada has a deficit in trade (and cross-border income), the external sector has to be lending to Canadian entities. Canada had a trade surplus in mid-1990s, but that has disappeared. This leaves the general government sector (that is, all levels of government). The government sector run hefty deficits in the early 1990s, but those deficits were erased over the following period, turning into surpluses. The only way this was possible was that the corporate sector was roughly in balance, and the household and external sectors were net borrowers. In recent years, governments have been tightening fiscal policy, and the government net borrowing has decreased. However, it would either require an improvement in the trade balance, or increased borrowing in the private sector, in order for the general government sector to return to balance. Given that the economy is already in a mild recession, I find it hard to see the business sector ramping up investment to allow that to happen. 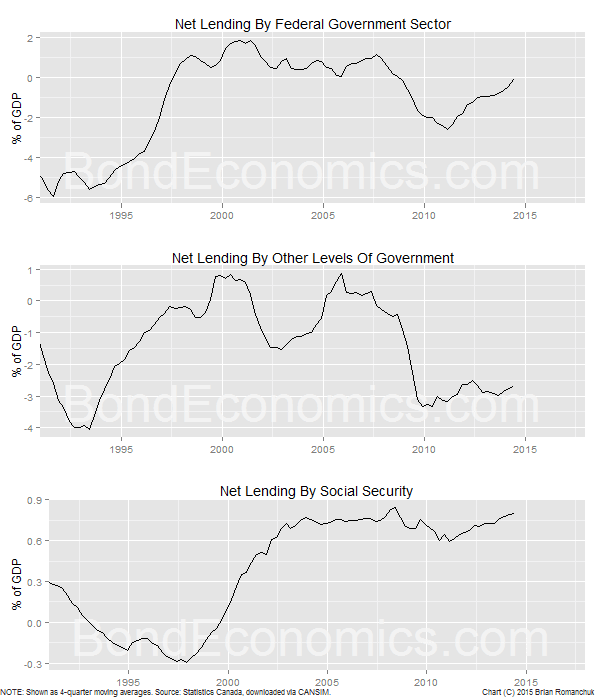 Within the "General Government" sector, the Federal government has moved towards having a balanced net lending position. The "social security funds" sector runs a small surplus. The implication is that other levels of government (provincial, municipal) are net borrowers. The push by the Federal Government towards balance slowed the economy, and the sub-Federal levels are stuck with net borrowing position of about 3% of GDP. For further reflection on these trends, the article "The right way to balance the budget: target the corporate surplus, not the government deficit" at Fictional Reserve Barking is highly recommended. Brian, have a look at the chart in http://fictionalbarking.blogspot.co.uk/2011/03/economys-flow-of-funds-is-closed-system.html much easier to understand? Also http://www.3spoken.co.uk/2015/10/uk-sectoral-balances-q2-2015.html where the corporate sector net flow of funds is split between financials and non-financials. Thanks for the links. I will think of ways of best presenting these data; I just got them loaded on my system, and did not have enough time to improve the presentation.